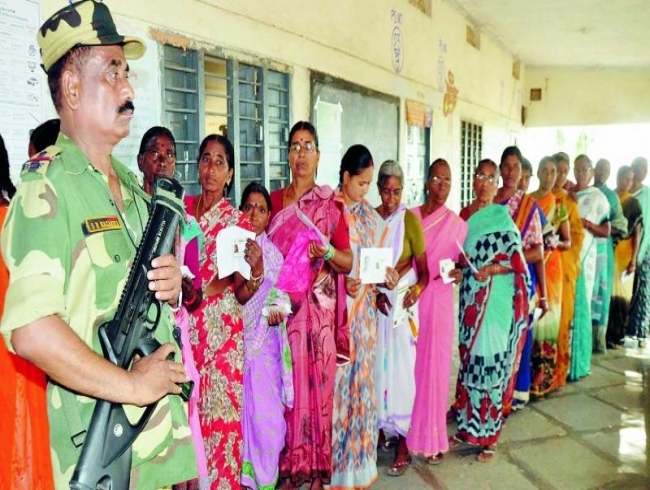 KARIMNAGAR/ PEDDAPALLI: Polling for 17th Lok Sabha elections began on Wednesday, slowly in the early hours, with less number of voters turning out to polling stations from various parts of Karimnagar and Peddapalli Parliament segments, but later gained momentum, with 68 per cent of voting recorded from Karimnagar and 59.24 per cent in Peddapalli Parliament segments on Thursday. The district authorities made elaborate arrangements for conducting the elections on a smooth note by deploying tight security at various polling stations established at several locations in the district. TRS Karimnagar LS candidate Boinapalli Vinod Kumar, along with his family members, exercised his voting right at the polling station established at Government Urdu Medium High School in Karimnagar whereas Congress Party’s LS candidate Ponnam Prabhakar exercised his voting right at the United English Medium High School in Kashmirgadda, along with his family members, and BJP LS candidate Bandi Sanjay Kumar exercised his voting right at the polling station established at Sadhana High School in Jyothinagar in the town. In Peddapalli, BJP LS candidate S. Kumar, a local candidate, exercised his franchise in Godavarikhani, along with Ramagundam MLA Korakunta Chander Patel, in Ramagundam and Peddapalli MLA D. Manohar Reddy in Peddapalli. Though the officials claimed that they provided all the basic facilities at polling stations, few instances of inconvenience were reported by the voters from both Parliament segments. Some alleged that they did not even receive polling slips and abstained from voting. Some returned without utilising their franchise, after arriving to polling booths and coming to know that their name was not present in the voters’ list. Meanwhile, in Rajanna Siricilla district, the villagers of Ayyarupalli village in Vemulawada mandal boycotted polling and remained indoors, opposing the move of merging Ayyarupalli village with Vemulawada municipality. Coming to know about the issue, district Collector Venkatram Reddy suggested district joint collector Yasmine Basha to visit Ayyarupalli village and resolve the issue. Along with trainee Collector Rahul Sharma, the Joint Collector visited the village and after interacting with them, she assured the villagers that the issue would be taken to the notice of the higher authorities and urged them to utilise the voting rights. With the assurance given by JC Yasmine Basha, the villagers of Ayyarupalli utilised their voting rights. Meanwhile, the villagers of Bandampalli in Peddapalli district also boycotted the elections, opposing the move to merge their village Bandampalli with Peddapalli Municipality. They also alleged that the officials did not distribute the voters’ slips to them. Even after several appeals by the election officials and tahsildar Srinivas, the villagers refused to exercise their franchise. The officials conveyed the issue to the higher authorities, but in vain. Polling process went on slowly in Maoist-affected areas of Peddapalli district and completed early by 4 pm. In some areas of Karimnagar city and Peddapalli Town, the polling was delayed due to certain technical issues with EVMs. The polling process gained momentum after the problems were rectified by the engineers, under the supervision of sectoral officials concerned.